"Our product is professional, quality voice files. Now as the National Highway Traffic and Safety Administration raises the bar on distraction free driving, companies are realizing voice files need to be as defect free as the brakes or steering linkage. A distracted driver is dangerous. Bad voice files cause disconnects between driver and computer and can have disastrous results; not only injuries and fatalities, but damage to a company's image, expensive recalls and lawsuits. Since 1999 we've specialized in finding and recording voices for computerized telematics applications. Now we helping make computers better listeners, i.e. raising voice recognition scores. In June, we finished a Speech Data Collection project which tasked us to locate 64 people, male and female, to record 300+lines in their normal (non-professional) voices in 8 languages - 22,440 voice files in all. 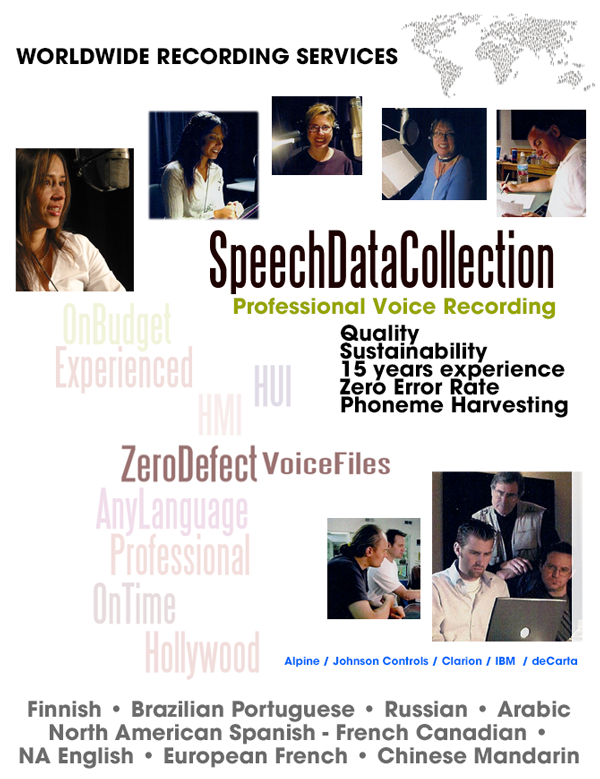 Overall, we've produced over 100,000 error-free voice files for our clients. To maintain our clients' standard of excellence, we put in quality assurance steps from the very beginning to detect and correct errors before they go into millions of vehicles. We take full responsibility for the project. We've recorded voicefile sets since the beginning of GPS navigation in 1999 for Clarion, Microsoft, Alpine and others.This SUSTAINABILITY is reassuring to upper management. 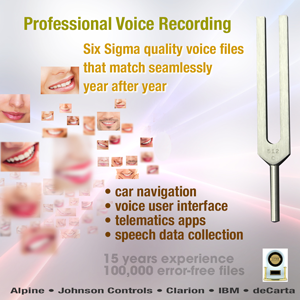 Not only do our voice files recorded over 15 years match seamlessly to each other, they are virtually error-free. We've never had to re-record a voice file. Our clients have never been sued because a voice file caused an accident. We keep the public safe and we maintain our clients' standards of excellence. I hope you'll consider us for your project. Please call me personally to discuss at 818 606-3538." 1) PRIOR TO RECORDING - Most recording companies get the scripts minutes before recording. So, mistakes are a given. We keep errors from ever entering the system. Our first Quality Assurance (QA) step is to have our language experts and producers review the script to ferret out bad translations, bad grammar, bad syntax, duplicate files, missing files and disconnects. We also check that new phrases work with what's been used before in the vocabulary tree. As they do this, the team localizes the phrases so that, for example, the French Canadian sounds authentic to the French Canadian citizens. All their changes and corrections are then approved by our client and the script is error free and ready for recording. 2) DURING RECORDING - Our second QA step is for a dedicated auditor to make sure every file is recorded exactly as scripted. We record much faster than most because the script is clean. Thus, we save client money on expensive recording studio time. 3) DURING EDITING - Our third QA step checks to be sure the correct takes are edited by the editor. For this we have an assistant editor who took time code notes during recording so good takes can be found instantly. 4) AFTER EDITING - Our fourth QA step is for the voice coach to review the final fileset for any performance errors. A pickup session is scheduled, if necessary. 5) BEFORE DELIVERY - In the final QA cycle, three people independently review every file to be sure all files are present, correctly recorded and named. Then, backup filesets are made, archived and copies sent to our client. This Template is an indispensable aid to choosing the best voice talent for VUI apps. Male Voice Samples from The Association from Fletch Murray/TheAssociation on Vimeo. Female voice file samples from The Association from Fletch Murray/TheAssociation on Vimeo.